The American Bar Association has urged the Senate Judiciary Committee and the full Senate to slow down the confirmation process for President Trump's Supreme Court pick, Judge Brett Kavanaugh, until the FBI has time to do a full background check on the claims made by Dr. Christine Blasey Ford and other women. 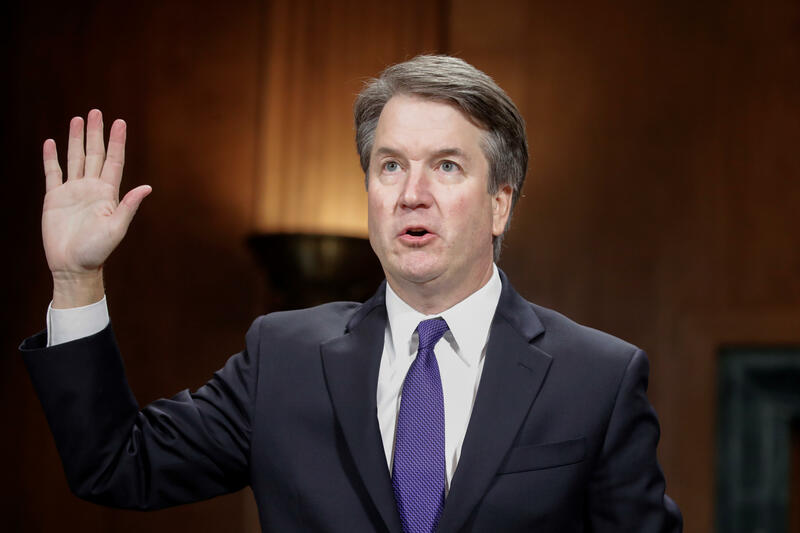 During hours of emotional testimony before the committee on Thursday, Kavanaugh vehemently denied ever having sexually assaulted Ford or anyone else, and cited as evidence his multiple background checks and clearances by the ABA during various stages of his career at the highest level of the U.S. judiciary system. Ford said hours earlier before the same committee that she was "100 percent" certain that Kavanaugh covered her mouth with his hand and tried to remove her clothing while drunk at a party in 1982, when they were both teenagers. As of late Thursday evening, members said the Judiciary Committee still planned to hold a vote on Kavanaugh's nomination on Friday. There was no immediate reaction from the committee to the new ABA request for a delay to allow for a full FBI investigation into the claims by Ford, and at least two other women alleging similar misconduct by Kavanaugh. Senate Democrats on the committee devoted significant time on Thursday to urging the same thing -- repeatedly asking Kavanaugh why he wouldn't wish for an FBI probe himself, to help clear his name if nothing else. Kavanaugh, and Republican committee members, indicated that his presence before them to answer the claims in person was enough. Kavanaugh repeated, however, that he would readily comply with whatever course of action the committee deems appropriate. Democratic committee members pointed out that while people who Ford says were at the party where the alleged incident occurred have provided written statements denying any recollection of such behavior by Kavanaugh, those potential witnesses have not been interviewed by professional investigators. If the Judiciary Committee does vote Friday on whether to proceed with Kavanaugh's nomination, even if he is referred unfavorably, Senate Majority Leader Mitch McConnell could still call a vote on the Senate floor as soon as Tuesday. Kavanaugh needs 51 votes in the Senate to become the Supreme Court's next associate justice, and with a 51-49 GOP majority, a handful of senators will determine whether he takes that seat. A few moderate Republicans and moderate Democrats, some of whom face contentious reelection races this fall, are as of yet undecided on whether to support Kavanaugh, who is President Trump's second Supreme Court nominee. The Trump administration and Republicans harbored some hope that at least the three Democrats who supported Justice Neil Gorsuch in his confirmation process last year might vote in favor of Kavanaugh's confirmation. The Democrats, North Dakota's Heidi Heitkamp, Indiana's Joe Donnelly and West Virginia's Joe Manchin, are bound to alienate voters no matter what they decide. All three are up for re-election in November in states that Donald Trump carried by wide margins. Click here for a look at the senators to watch over the next few days.